Two Brothers Brewing Co. is a small, 100% family owned brewery which is located on the outskirts of Chicago in Warrenville, IL. 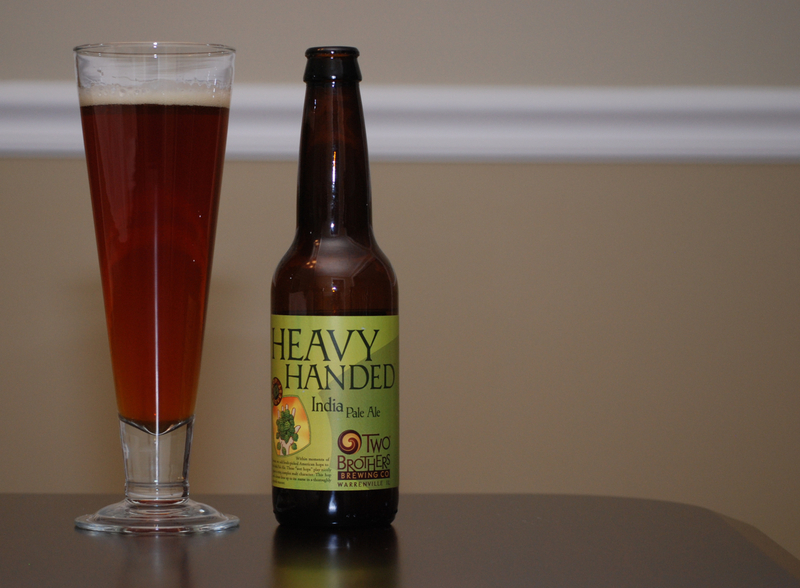 The Heavy Handed India Pale Ale is one of their seasonal beer offerings which is available from September to December. I picked this up as part of a mixed six-pack at The Foodery in Center City Philadelphia. Appearance: Reddish orange color. Slightly cloudy. Quarter inch head that dissolves quickly. Heavy lacing remains on the glass. Aroma: Carmelized sugar. Pine. Citrus. Had the wife give a second opinion and she picked up on some honeydew melon. And let’s not forget the hops. Taste: Lightly carbonated. Creamy mouthfeel. Starts off slightly sweet like a tea biscuit. The hops kick in towards the middle and I start to pick up on some alcohol (not overly boozy, but you can definitely taste it). Gets sweet again towards the end and has a moderately dry and spicy finish that lingers for quite awhile. Once again, a brewer messes with my expectations. When I think IPA, I think hops, hops, and more hops. While the Heavy Handed IPA definitely has that hop bitterness that I have learned to love, it also has a good bit of sweetness to keep things in balance. I wonder if the “Dry Hops vs Wet Hops” factor has something to do with it. Is it similar to using fresh herbs vs. using dry herbs when preparing a meal? While this isn’t my favorite IPA (Ballast Point’s Sculpin IPA still rules the roost), it’s still a very good beer which I really enjoyed. You can definitely taste the alcohol, but it’s not overpowering, and the sweet/bitter elements help to keep things interesting from beginning to end. Interesting. Highly unusual for a brewery to release its IPA as a seasonal limited release – especially these days when more and more, IPAs are flagship brews. I’m not familiar with this brewery – perhaps this is a traditional “wet hop IPA” substyle much like Sierra Nevada’s Wet Hop and Bert Grants Fresh Hop brews. Of course, I could visit their website to see if they have a year-round IPA. If so, my comments would be worthless and I can’t have that. Would make far too much sense. Had their Rye Beer (Cane and Ebel?) while I was out in Ohio for a business. It was very interesting. I didn’t know this brew had made it this far East. Did you score this in Philly or NJ? Picked it up at The Foodery. I liked the Cane and Ebel too. They make some interesting stuff. Curious to try more.